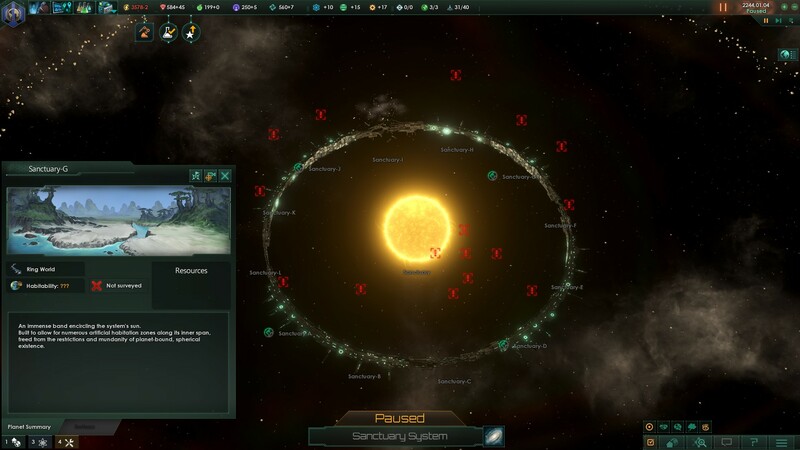 Stellaris: Utopia [Steam, Paradox Store] is the big content expansion I have been longing for, but is it worth picking up? Disclosure: DLC key provided by the developer. Note: Previous saved games will not work with the 1.5 update, you will need to opt-into the previous version in the Betas tab on Steam. These aren’t just my thoughts on the expansion, but my thoughts on the game as it stand now with the latest patch and expansion together. I spent a number of hours testing a preview of the patch and DLC to put some thought into how I feel about the game now. I won't be able to comment on every single new thing, as that would be impossible given how many hours you need to put into a single save to see them, and you won't always see every feature in one play-through due to the random nature of the game. 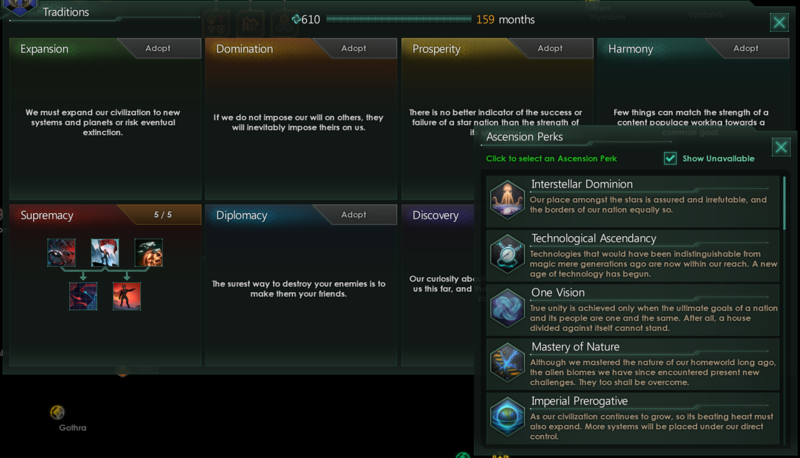 While I find Stellaris to be a fun game, it has lacked a lot of content right from the early game to the end game. If you’ve played it a number of times, you will likely agree with me on this. You will end up seeing the same events repeatedly and it does end up feeling stale. This expansion does fix up some issues I had with the mid to late game, but the early game still ends up feeling a little too flat. 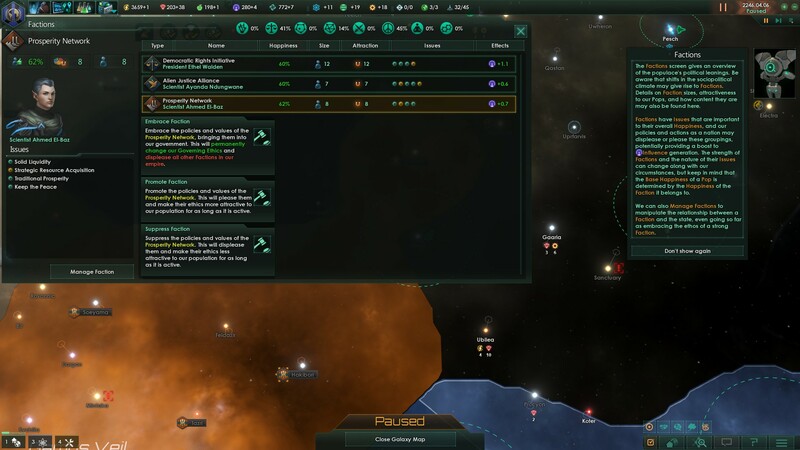 This new Utopia expansion includes build-able Megastructures like ring worlds, Habitat Stations which act like small planets, Ascension Perks to further customize your empire, Indoctrination to deal with primitives, Advanced Slavery options to better deal with conquered planets, Advanced Government options and more. Also, as usual for Paradox, the expansion came with a big patch named Banks, you can read the full update notes here. There’s too much for me to list here though, so I do recommend checking it yourself. It does include a bunch of performance changes, to help with the late game. I noticed some complaints about that before, but the only issue I've seen on my current save is a bit of stutter when zooming in and out quickly and often, apart from that it has been really smooth. The Factions system also had a major rework, no longer are they just rebels, but they make up a more in-depth system of political movements each with their upsides and downsides. If the faction is happy they will give you influence and I have three factions. I think I've been lucky, as all Factions that pop up are pretty happy with how things are going, but one faction doesn't like the idea of war so I might have to suppress them. It makes the gameplay more interesting, as you work to please or suppress these groups within your society. The new Unity resource and Traditions tree (free patch feature) does add some needed extra depth to the game. With the ability to pick different unlocks in a tree based on your playstyle. As a warmonger, I obviously opted for the Supremacy tree first. Unlocking items in it gave my navy and armies a nice boost, which I sorely needed if I was going to push the other races. This then rolls into the Ascension Perks system from the DLC when you complete a tree. You gain access to unlock a perk of your choice like increased research speed or increased border size. One of the biggest and most useful changes is making the Food resource empire-wide and not per planet, it’s made a small hassle much less of an issue. It also allows you to really specialize your planets. Since one could be a massive food production colony, while others could be left to other endeavors. It makes more sense considering the other gameplay mechanics. Take Energy for example, that’s always been empire-wide in the form on Energy Credits, so it makes Food just fit in a bit more. 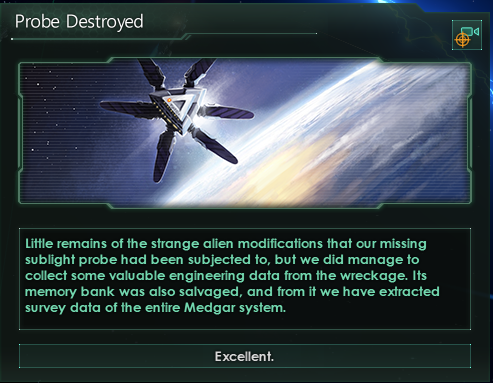 Something from an earlier patch is an event dealing with sublight exploration probes, during my playthrough on the Banks update I got them quite early on (when I never had before), they made the earlier game a good bit more interesting. Each probe has a different history, which was actually a little exciting. One I found had been modified by an alien race who had given it an AI and they didn’t like me very much, once they realized I was their creator they wanted to destroy me. A fun encounter, even if it’s not from this specific update it was nice to finally see it. For all the work they’ve done improving the later game, there’s still a good 2+ hours at the start of each game where nothing truly interesting happens, and that’s at the faster speed too. They really, quite badly, need to beef up the starting hours to help people keep investing their time into it. Another problem is repeatedly seeing the same events which makes it end up a little boring. There’s only so many times I can be bothered by a science ship finding old mass driver rounds. Cool the first time, but the fifth time? No. My issue is that small events like that are easy to write, so just write more of them. Make it more varied and interesting for players to play longer games and play more games. Combat in particular is still quite boring. Nothing really happens apart from sitting back as you watch your ships dance around each other firing off their weapons. Look cool for sure, but it needs more user interactions. For a strategy game, there's a distinct lack of strategy when it comes to battles and that goes for ground battles too. I do hope they work on more content for the early to mid game now, as it feels like a sore spot. Still, with Utopia and the last two patches it feels vastly better overall. Is the expansion worth it? Yes, for sure, but the game as a whole still needs more. I guess the lack of interaction in battles is intentional. All Paradox games have this lack of focus on tactics during battle, all that a battle gives you is a result and some info that you can use in your strategy, like which unit type scored a lot of hits and which one didn't. I don't really have issues with the lack of tactics personally. Concerning the small amount of events, you're right of course. NakorOnFlipFlops I guess the lack of interaction in battles is intentional. All Paradox games have this lack of focus on tactics during battle, all that a battle gives you is a result and some info that you can use in your strategy, like which unit type scored a lot of hits and which one didn't. I don't really have issues with the lack of tactics personally. Concerning the small amount of events, you're right of course. Have you played HOI 4 ? Or do you want something even more micro managed than that? I wish we could set the default behavior for each class of ships, IE how Battleships will sit back and fire from max range. I want to be able to make destroyers do the same thing. NovenTheHero I wish we could set the default behavior for each class of ships, IE how Battleships will sit back and fire from max range. I want to be able to make destroyers do the same thing. Bingo. That's the sort of thing I would expect, even simple things like that. This isn't how combat works in any of their other grand strategy titles and I don't think they'll ever add anything more micro-intensive. On the whole the combat systems shy away from tactical decisions. The decisions you're supposed to make are done at the ship design level: what hull parts, what components, how many and so forth. These affect the effective range of battle, evasion of ships, ability to absorb damage and basically how your battles play out. This is why in most patches the most noticeable changes to combat are how they rebalance weapons and components. A fleet heavy on fighter/bombers fights in a very different way than one heavy on large battleships and tachyon lances. On top of that are admirals and their traits as well as faction-wide modifiers that adds some diversity. What I think is likely we'll see eventually is that admirals play a more important role in combat. More in line with HoI, EU and CK where they can pick tactics from a list according to your doctrines/their experience/their traits and whatever else. I'd like to see them add "terrain" (such as asteroids, nebula, proximity to atmosphere) to bring it more en par to the positioning decisions in their other games but even that seems unlikely without potentially making the map an unreadable mess. Ignore a Paradox game for a few months, and when you come back to it, it's like you're getting a whole new game. Well, I don't think the battles are that micro-managed, but maybe we have a different definition. It's true that that 'front lines' thing in HOI 4 doesn't werk that well and you have to direct your armies separately (which is what I think you're referring to), but you still don't really have something to do during battle. You're not putting the artillery up front and the soldiers at the back and telling them when to attack on which flank. You can still just watch the report rolling in and then take decisions. When I think micro-management I think StarCraft or even X-Com. Those battles are micro-managed. Quote For a strategy game, there's a distinct lack of strategy when it comes to battles and that goes for ground battles too. I believe you're confusing strategy with tactics. Strategy is choosing the composition and disposition of your forces to be most favorable to yourself, and choosing where and when you engage an enemy to stack the deck in your favor as much as possible. Moving fleets around the galaxy and choosing where you fight, that sort of thing. Tactics is controlling individual elements (like ships) of a battle, and isn't really a thing in any of Paradox's game—you're supposed to be winning the war at the "Sun-Tzu grand-strategy" level, not the "individual skirmishes of each battle" level. NakorOnFlipFlops Have you played HOI 4 ? I heard of it and I think I even saw it on steam at some point. Was just asking OP how deep tactics they wanted , is all.